Formal suit made from blu-white striped linen for spring summer groom. Topstitch at 6mm from the edges of the front, col... 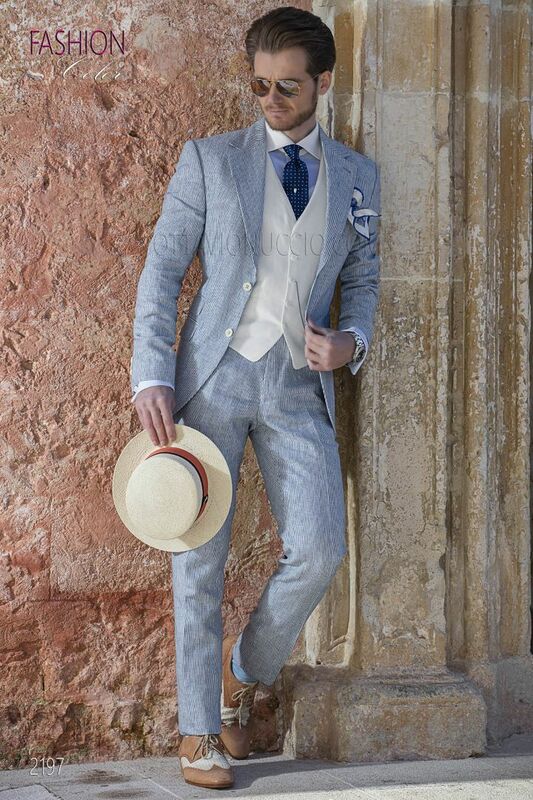 Formal suit made from blu-white striped linen for spring summer groom. Topstitch at 6mm from the edges of the front, collar, pocket flaps, cuffs and chest pocket. Notched lapel with 2 buttons closure. Flap pockets, ticket pocket and angled buttonholes. 4 signature buttons and open buttonholes at cuffs. Weste, elfenbein, aus Leinen, mit Kontrast und 5 Knöpfen.